Prior to this programme almost no one in PNG was commercially selling Long Lasting Insecticidal Net (LLINs) except Brian Bell. All other mosquito nets available in shops are untreated Chinese nets of variable quality, some claim to be LLINs or treated, but none are WHO approved. To create a better market and improve availability RAM has employed a salesperson market WHO approved LLINs in Port Moresby and then the rest of the country. In addition to LLINs, insecticide-treated curtains and Australian developed repellent Mosbar are also being promoted. The program was suspended for much of 2016 pending negotiations with the PNG Government regarding GST treatment and clarifying the distinction between the bed nets being sold in this program and the bednets being provided free of charge through the Global Fund sponsored distribution and the Chasing Malaria program. This was resolved in early 2017 and the program is back on track. There are now 33 outlets selling nets in Port Moresby at this time but most of them are centrally located. Work is continuing to achieve wider coverage. 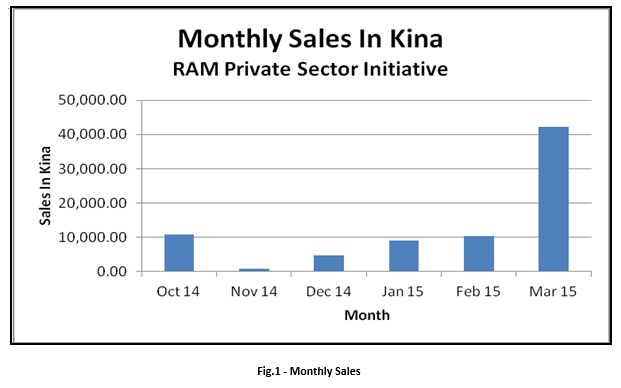 Total sales revenues have been 77,000 Kina with about 57 bales of nets sold and almost 2,000 Mosbar (See Graph Below). Even with excluding traditional sales to companies such as Brian Bell, the project is presently raising enough revenue to cover the costs of the project to date. Mosbar has also been targeted at rural villages with malaria problems identified by the ‘Chasing Malaria Programme’. Follow up surveys showed that the Mosbar has been very popular with the villagers and works well. Net sales are increasing in villages. Advertisements have now been developed to promote nets and Mosbar throughout PNG. To reach all trade stores in Central (Kairuku, Rigo and Abau). Kerema (Kerema Town and Malalaua and outlying parts of NCD such as Buruni, Vabukori, and Nine Mile. Targeted sales into villages most affected by malaria for both nets and Mosbar. Advertise nets and Mosbar in national Newspapers to get sales outside of Port Moresby. Undertake sales trip along Highlands Highway from Tari to Lae.